The Oromo Liberation front strongly condemns the mass killing of Oromo Students and farmers across Oromia for the last three weeks by the TPLF minority regime. We also condemn the massacre the TPLF regime has committed against people in Gondar. For the last 24 years, the TPLF Regime has been committing numerous heinous crimes against all people of Ethiopia. The TPLF regime killed thousands, arrested thousands, and expelled thousands from their lands and birthplaces. They disposed and displaced thousands from their ancestral lands, and used for their benefits. These actions show how cruel and fascist the TPLF/ EPRDF/ Minority government has been in Ethiopia. The TPLF regime which has no mandate from Ethiopia people though has been known for its pedagogical lies, corruption and crimes against all people of Ethiopia; specifically it has targeted the Oromo people to control their fertile resources. Thousands of Oromo farmers are losing their lands under the pretext of Integrated Master Plan of Addis Ababa (Finfinnee). The deliberate killing of innocent people who peacefully protested against land grab from Oromo farmers by TPLF army which is armed to its teeth, foreshadow a looming genocide against Oromo people. This cruel regime is able to commit all these crimes by dividing the people of Ethiopia. Now, time is an essence for all peoples in Ethiopia to stand firm with Oromo people who have been fighting the TPLF regime for freedom, democracy, justice and human rights. 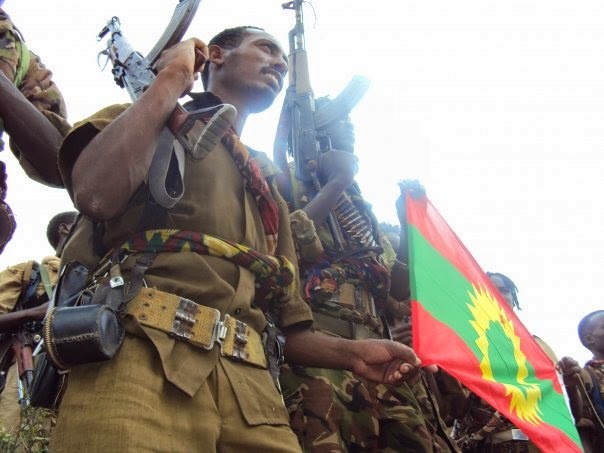 The Oromo struggle is a struggle for freedom, justice, equality and human rights. When Oromo people are free from TPLF regime, all people in Ethiopia will be free. We are also encouraged by the support and solidarity of different Ethiopian political & Civil Organizations against the massacre of Oromo students and farmers by the TPLF regime. Now! The OLF calls upon all Ethiopian to join the Oromo people struggle for freedom, democracy, justice & human rights, and once for all to dismantle the genocidal regime of TPLF. To that effect , the OLF calls for all inclusive struggle that include all political parties and civil organizations that will enable the Peoples in Ethiopia to decide their destiny by establishing government of people , for people and by people in Ethiopia. We also warn everybody to be vigilant against possible evil actions of the TPLF to instigate animosity in the country by destroying property and killing none Oromo’s and blaming on Oromo’s. The TPLF will do this to disrupt this genuine movement towards freedom, democracy, human rights and justice. The Ethiopian people should be aware of the motives of the TPLF as it has been doing for the last 24 years since it seized political power in Ethiopia. It is widely known that the Oromo people have no problem with other people of Ethiopian, except with the TPLF and the systems that have been killing them, disposing them from their lands, arresting them & torturing them. Finally, we call upon the International Community to stand with Oromo people, not with the minority TPLF Regime in Ethiopia. Let’s stand together against the TPLF minority genocidal Regime. Victory & Justice for All!! !